As a third-generation arborist and three-time world tree-climbing champion, I’ve learned firsthand that trees are much more vulnerable than we assume. A tree might seem like it would be able to sustain the forces of a large storm, but sometimes internal damage is just too difficult to see. Ultimately, you want to be prepared before, during and after any storm – big or small. Develop a relationship with a certified arborist or tree care professional. This will give you time to pick and choose the right company in your area. When a storm hits, you’ll likely be prioritized as an existing customer. Here are 10 questions you should ask when interviewing tree service companies. Conduct a pre-storm assessment. Identify trouble spots before a storm hits. *Note: Several of these features may suggest that the tree may be suffering from a condition called heart rot or possibly buckling under its own weight, and causing danger. Take measures to prevent damage. After assessing possible hazards to your property, you and/or your arborist may need to take any number of measures to limit potential damage. Check your gutters, and remove debris to prevent water damage. Many STIHL blowers can use optional gutter attachments. Your property is not more important than your life and the lives of your loved ones. Prepare in advance, follow guidelines for evacuations, and don’t hesitate to get assistance. It’s important to protect yourself as well as your property. Be on the alert. Stay away from utility lines and keep an eye out for dangers both up in hanging branches and down on damaged trunks. Look for trees leaning against or touching downed phone lines or power lines – a tree in contact with a power line, and the ground at the base of the tree, can be energized and dangerous. If you’re skilled enough to do work yourself, suit up properly, wear the proper attire and protective equipment. Many times we see newscasts of people wearing shorts and flip-flops to clean up storm damage. This is not what you should be wearing to do this type of work. Follow the guidelines in your instruction manual for any power equipment you’re using. Other than storm damage, is the tree basically healthy? Are major limbs and/or the leader branch still remaining? Is at least 50 percent of the tree’s crown still intact? If you answer “yes” to the majority of these questions, there is a good chance the tree can be saved. When in doubt, consult a professional. Take Steps to Repair Minor Damage & Debris. Remove any broken branches or stubs still attached to the tree. Remove jagged remains of limbs to reduce the risk of decay agents entering the wound. Smaller branches should be pruned at the point where they join larger ones. Resist the urge to over-prune. Don’t worry if the tree’s appearance is not perfect. Do not try to do it all yourself. 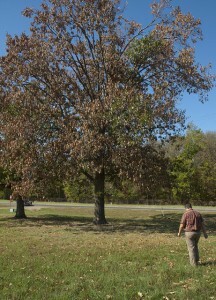 Large limbs are broken or hanging or overhead chainsaw work is needed. If a tree is uprooted or downed, it can create an unnatural pattern of pressure points and tension. A chainsaw operator may be in severe danger if attempting to cut a tensioned limb or trunk (called a “springpole”) – it may have an extremely violent, catapult-like reaction. If branches are too close or touching utility lines, report immediately to your local utility company. NEVER attempt to move downed utility lines. Any task you have not been properly trained to handle or are uncomfortable undertaking. Birds or bees may have been taking temporary storm shelter while you are doing work – always proceed with caution. This entry was posted on Monday, October 8th, 2018 at 2:22 pm	and is filed under Lawn & Garden, News & Updates. You can follow any responses to this entry through the RSS 2.0 feed. Both comments and pings are currently closed.